I recently attended a conference that was held in Innsbruck, a city found in the Northwest of Austria, not far from the German border. It’s tucked away in a mountain valley, which makes it a very picturesque place for a weekend break. It was my second visit to the city; the last time was over a decade ago, and the city hasn’t changed much – which is a good thing. It’s just peaceful and quiet yet still has a city, urban excitement to it. With both an airport and rail service direct to Munich (driving is about 2 hours, train depends on which service you take), and while the Euro doesn’t stretch terribly far in this part of Europe, you can still find a good bargain on a budget. Here are a few highlights. Glacial waters, classic architecture, mountains for miles. One thing I love about Innsbruck is that there are so many wonderful cafes, bakeries, and restaurants with wide terraces perfect for sitting and relaxing, allowing you to admire the architecture and the mountains and soak up the Tyrolean atmosphere. One cafe, Cafe Moustache (yes, it even has a big fuzzy moustache out front), has super-cheap sandwiches, coffees, and drinks. Tip: they have their terrace out back, and there’s usually a spare seat. They’re open late too so if you’re looking for a bar for a before-bed tipple, check it out. Surrounded by mountains, you have plenty of choices for hikes and outdoor activities in Innsbruck – you should at least head up the Gondola to get a good view of the city. One great resource for hikes is the information pack you get with the Innsbruck Card – which gets you access to many of the transport options to get to the best hikes. If you plan on doing some further-afield exploring it’s a good option to have. If you can’t decide, just head up to the Hungerburg in the cable car, and there you’ll find a giant map of all the trails you can choose from there. 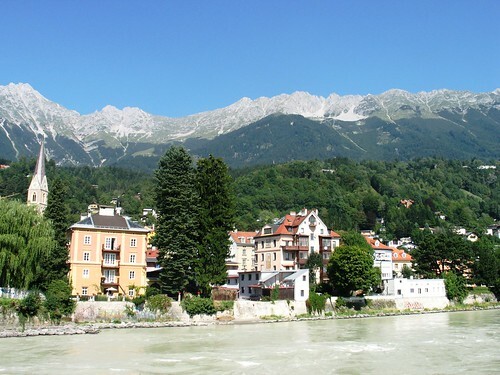 Several of Innsbruck’s most famous attractions are free – so why not take advantage? You’ll certainly want to walk along the river for one of the iconic photographs of the colourful houses, like shown above. But what else? Many visitors love exploring the city’s churches. The Cathedral of St. James is the most popular, and it’s just steps from Cafe Moustache, so it’s quite central. Maria-Theresien-Strasse is a shopping and dining street, but I think you’ll find many interesting pieces of architecture to photograph in between coffee breaks. Have you been to Innsbruck? Any recommendations? Photos by: Leo-seta, Andy Hayes.